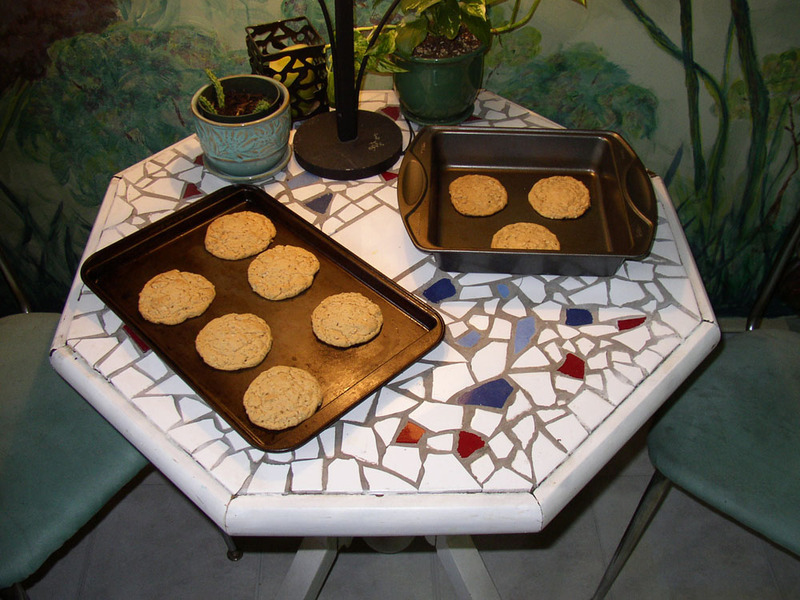 Peanut Butter Oatmeal Cookie Recipe Included! As I’ve mentioned before, both of my grandfathers were carpenters. So when the old TV finally died, this Grandad used his skills to built up the center for holding a new (at the time) TV. I’m starting to see this re-purposing trait I have might be genetic. I loved the quirky cabinet, but I’ve always felt a little ambivalence towards TV programming in general. Then I changed my life by taking up the guitar seriously in 2005. By 2007, I was intensely focused on learning more about music, and was even starting to write songs. I pretty much lost interest in watching anything. 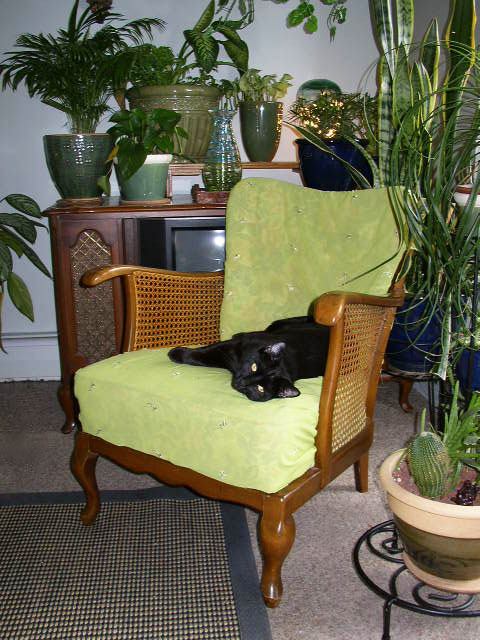 The vintage cabinet lived behind a chair, and served mostly as a decorative shelf for plants. 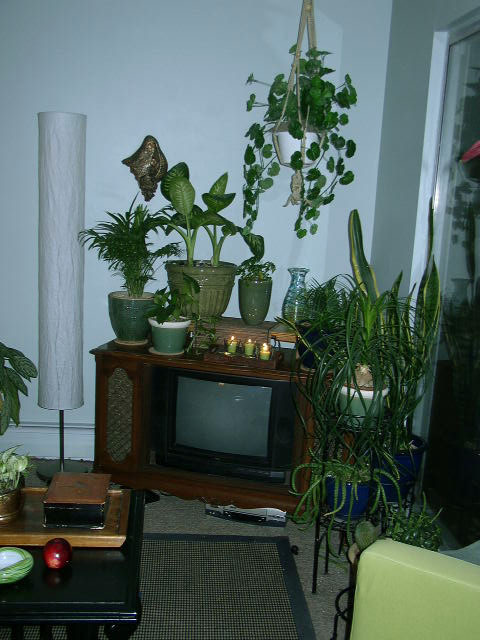 I held onto the cabinet for awhile, with grand visions of turning the center space (sans TV) into a water feature, or even a diorama-style miniature garden grotto. Unfortunately, I didn’t have the space to store the cabinet until that magical day I would have the time to actually invest in such a project. After decades of paralyzing stage fright, I was now hot in pursuit of playing music out in the world. Eventually (2009?) I gave the cabinet and TV away to someone who could appreciate them. As I write this, it seems like I am implying that one needs to give up television in order to pursue one’s creativity. Well, hey, I still have an internet connection, and I am not unfamiliar with the entertainment value of marathon-streaming favourite TV shows. When I do this, though, I am usually working on something else: I’m drawing, sewing, or painting, and I’m also watching the Doctor enact his 7,354th planetary destruction prevention plan out of the corner of my eye. What I can’t do is flop in front of a TV and flip through the channels until I find something distracting enough to settle on. I can’t use it as a way to disconnect from the world around me. It’s like eating junk food all the time. It’s not good for me. Boredom IS good for the soul. It makes me more creative. 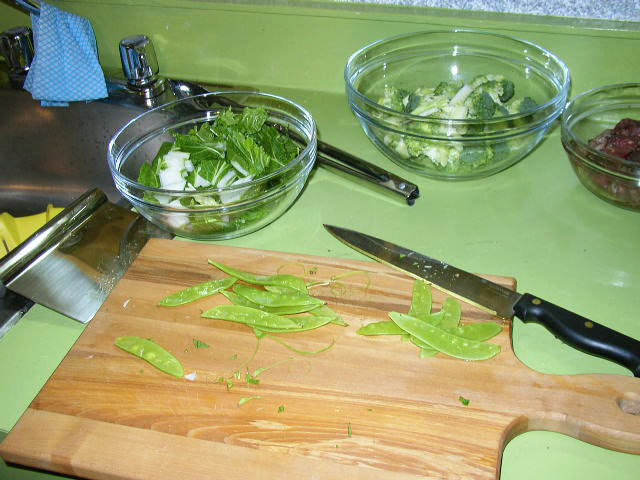 Listen, nobody but a true ascetic really wants to live on nothing but vegetables. Everybody wants a cookie now and then. But creativity is something that requires nourishment from a huge variety of sources. Mindlessly entertaining your brain is the exact opposite of using your brain to dream of new ideas and interpret them through your chosen media. I could write about twenty paragraphs on why I think TVs are a waste of space, both physically and psychically. But this post from Man vs. Debt sums it up so well, I don’t have to. Being more creative means, ultimately, living in the moment and not constantly distracting oneself from it. The creative mind thinks up things to fill the empty spaces in time and task, rather than filling the void with mindless junk food entertainment. If you are having trouble finding the inspiration to create, try unplugging your TV for a few weeks, and see what happens! 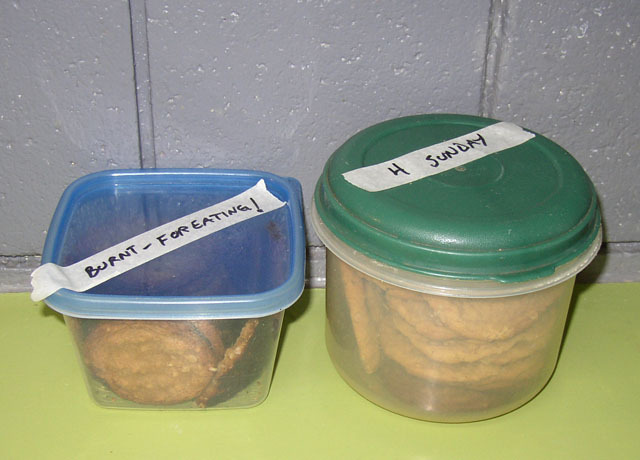 Here is my very own recipe for the cookies shown above. I’ve adjusted it a couple of times and I think it’s almost right, but next time, I am going to try adding chocolate chips, too. If you want to play along with me, I’m thinking somewhere between 1-2 cups. Incidentally, I recently gave a dozen of these, fresh out of the oven (possibly from the batch shown cooling up there), to my musical mentor. He ate all 12 in one sitting. Preheat oven to 325 F. Cream butter, peanut butter, vanilla, and sugar until smooth. Add eggs one at a time and beat till well-blended. Combine flour, baking soda, and salt in a separate bowl, then stir (don’t beat) into the creamed mix. Stir in oats until just mixed. Drop by spoonful onto cookie pan. Bake 6 – 9 minutes. Don’t bake too long or they won’t be soft and chewy. This makes a lot of cookies. I don’t even know how many. Maybe 4 dozen? I like to freeze chunks of the dough and bake smaller fresh batches as I need them. Going to try your recipe – they look so good!